For number thirty-four in the Fun Friday Color Image series, we are once again featuring the work by Patty Allison of Imbued With Hues. Today we are featuring a colorized set of six images of General Motors concept cars that took part in the GM Motorama exhibitions. 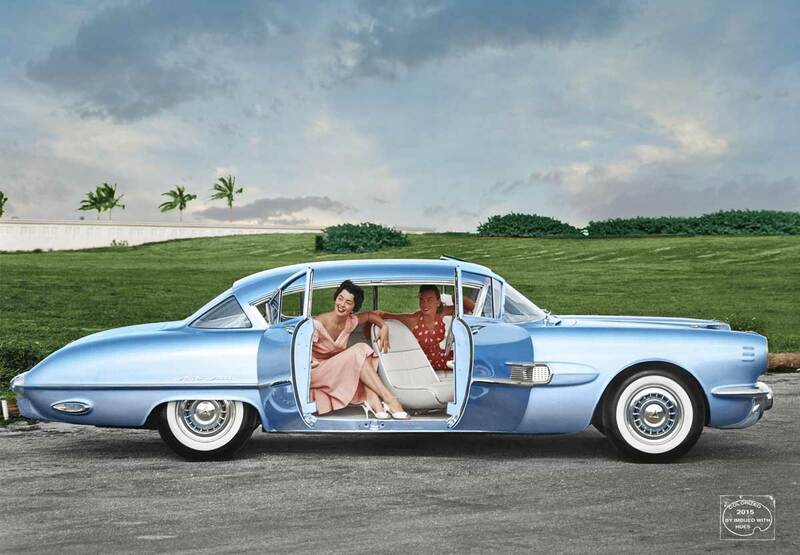 The GM Heritage Center site has documented a good cross section of many of the “dream cars” produced at Corporations prototype and concept car facility. There you will find photos and information on many of the General Motors concept cars produced by the automaker. Coverage at the site begins with the 1938 Buick Y Job designed by Harley Earl the head of GM Art and Color design division that designed all of the Motorama concept cars. The lead image shows a rarely seen and distinctive rear view of the 1954 Oldsmobile Cutlass Coupe Motorama show car. The links to each car that follow also go to the Heritage Center’s photos and information section covering that GM styling exercise. 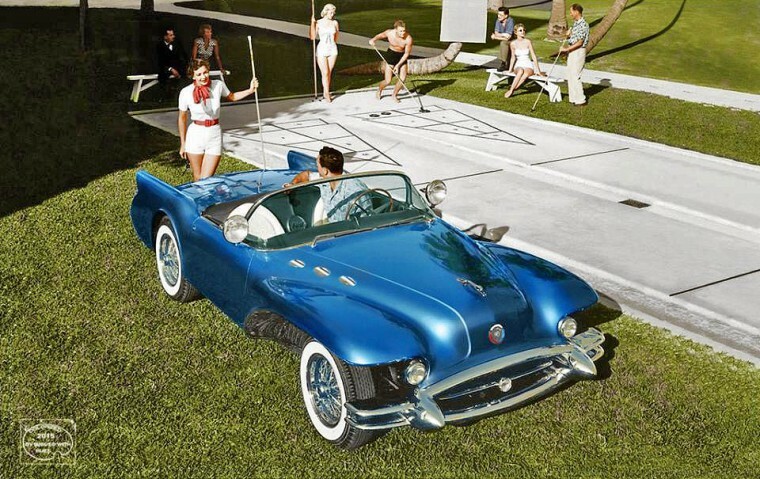 1954 Buick Wildcat II Motorama concept car. 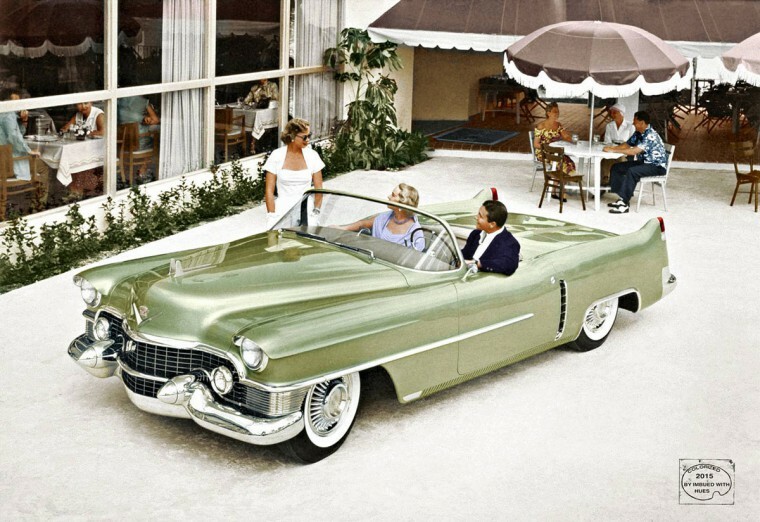 1953 Cadillac LeMans concept car. 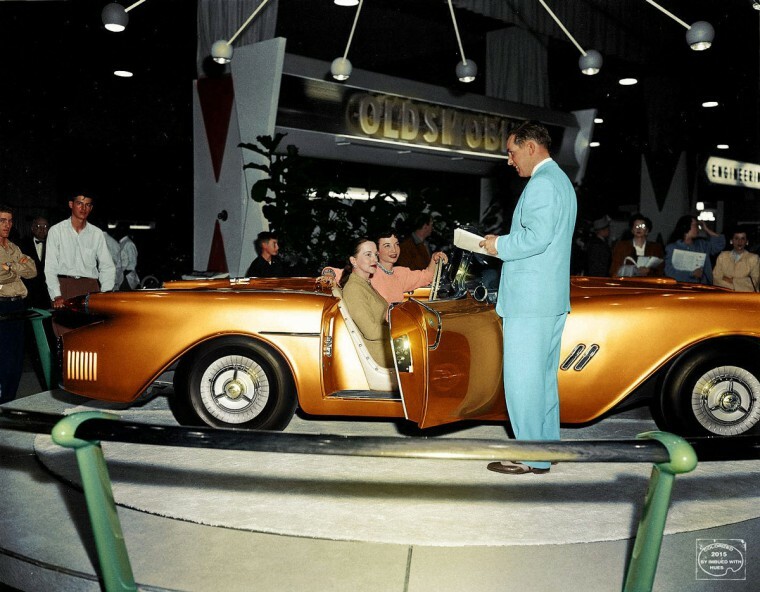 1954 Oldsmobile F-88 Motorama concept car. 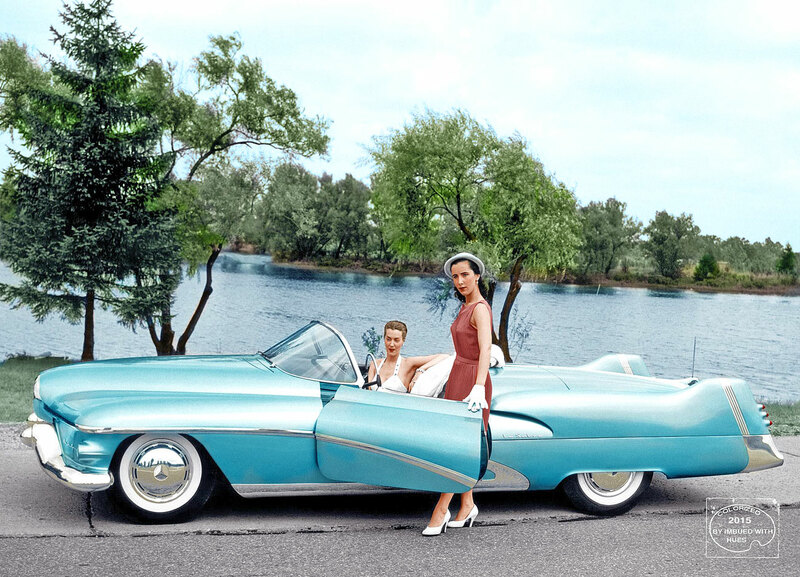 1951 General Motors LeSabre Motorama concept car. 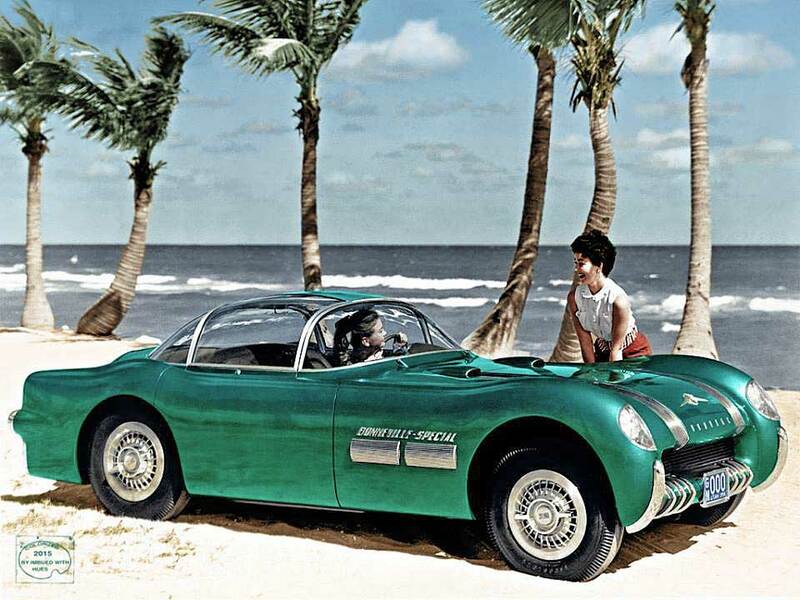 1954 Pontiac Strato Streak concept car. 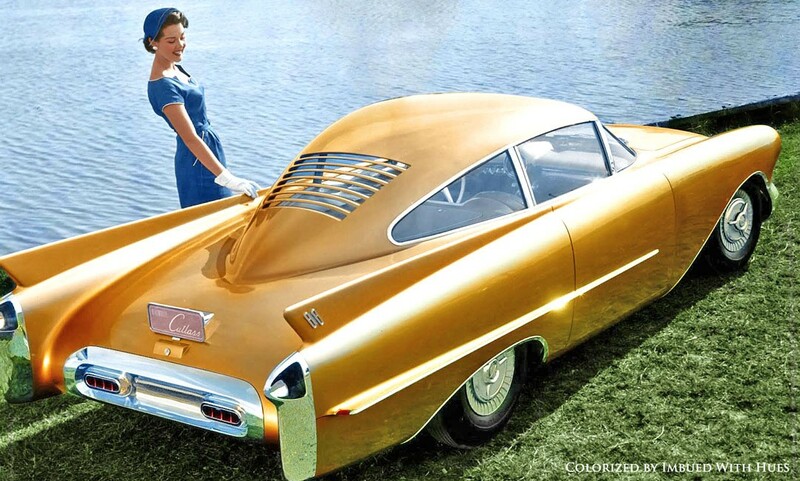 1955 Oldsmobile 88 Delta Motorama concept car. This entry was posted in Auto photos 1946 - 1965 and tagged 1951 General Motors LeSabre, 1954 Oldsmobile Cutlass Coupe, 1954 Oldsmobile F-88, 1954 Pontiac Bonneville Special, 1954 Pontiac Strato Streak, 1955 Oldsmobile 88 Delta. These cars were all before my time, and to me, looked like the designers went to “parts bin” and randomly put pieces here and there, to create a different looking car. I can see many features on these that made it to production down the line. ( or from older cars) While these look silly to me, there was no “crystal ball” to see into the future, the designers thought this was what we’d be driving in 1984. The added colors are nice, and really enhance the images, as most pictures we saw were black and white. 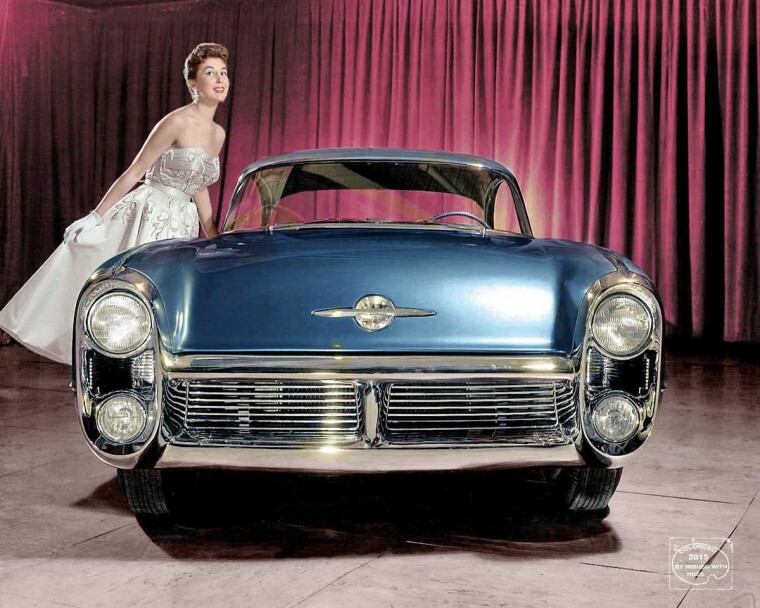 I was eleven years old in 1954, and I can tell you that the Motorama concept cars were the stuff that dreams are made of. They may look old hat now, but back then they were the future incarnate. I was lucky enough to attend several G.M. Motorama, and I can say from experience they were spectacular. I am I life long car guy, and have enjoyed the collector car hobby for more then 50 years. There is nothing comparable to theses wonderful shows. There are car shows every year now, but they almost never get our imagination going the way the Motorama, or the parade of progress, or any of the other concept car events did. Concept cars at the New York, Or L.A., Tokyo, or Paris are nice and usually closely resemble production cars to come, in the 50’s they were pure fantasy. In the 50’s when the cars changed every year there was a whole crowd of people, myself included that tried to sneak into dealers back rooms to get a peek at the new cars. There is nothing like it now, I know I was there. From a styling point of view the cars were much more interesting then, now everything is a formula of some sort. Tommy, you are so right in your comments about these cars at the time of their introduction. For younger people, just take a look at the cars that had been produced just before and after WWII and you will see the excitement. My father, in 1953, took me to downtown Rochester, NY to see the new Corvette that was on display in a grand bank lobby – yes a bank. I will never forget the excitement, as this was the beginning of my passion for all-things Corvette. Gordon, I believe it was in late 1948 or early 1949 I was 5 or so , anyway my father took me to see the “NEW” 1949 fords, The first new fords after the war. and about that time he also took me to see a traveling show, It was in a tent, the new Tucker, I was wowed and become a lifelong car nut. it was so exciting then, I love cars. over time I have had a ’63 Split window, a ’65 Mustang convertible both of which I bought new. a ’65 300 L, the last lettered real 300, a ’58 Cadillac Fleetwood amazing car, and a ’66 Thunderbird convertible, the last bird convertible. I learned to drive, and got my first driving test in my Fathers 1956 Jaguar XK150 drop head. ah the memories so wonderful. Howard you need to dig a little deeper than just looking at these pictures. That first car is the 1954 Olds Cutlass. Look at that roof shape. Where did you see variations of it again? Look at a 1963 Corvette and a 1963 Buick Riviera. See any similarities? The design started in 1954. All of the Concepts then and now have styling cues that may or may not be used down the line. They were built to collect public reaction as to what the future would hold for them and what the public wanted. They got people talking and eventually into the show rooms. They were as exciting to the public then as the cars at the big expos are to people are now. They exited the minds of America and the World. To become a car designer. The scenery doesn’t look like that when I drive them. Wow, I think these cars are great. It’s not often that you get to see what could have been. Just imagine what it would have been like to drive one of those, such beautiful lines and the colors that Pattie added are spectacular, great job by all. Say what you want, going to the Auto Shows and seeing these concept cars made your heart leap. I was given a ride in the LeSabre during a test drive, thru downtown Chicago. I remember when I was a teenager, my friend and I took the train into Manhattan, from Long Island, to see the GM Motoramas at the Waldorf Astoria Hotel in the ’50s. The cars were sensational and GM tried to show the public what the future would look like. The best part was that admission was free. The “dream cars” of those days were always much closer to production than those of today. The parts bins of those familiar bits of design came after, not before, the dream cars were designed. A great view into the past…..As a young guy I started my car hobby and now a vintage aged gray hair model hair builder building…..nothing being stock. Listening to the comments of the people older than I, it’s amazing what 10 years will do. My generation was oogling ’64 427 Ford’s and ’65 GTO’s, and these designs looked horribly out of date. ( quite frankly, to me, they still do) However, I can understand the same feeling people had for these cars that we had for ours. The thing that hadn’t changed, was the anticipation of what the new cars would look like, and someone would score some automotive journal from their dad that showed, the “new” ’62 Pontiac Bonneville. I’ve totally given up on trying to guess the year of newer cars. All the same. Remember when car makers put the year on the tail lights? Yes, I do remember that Howard. I looked at tail light lenses more than once to verify that! The colorization really enhances the beauty of the women in the photos. I really like the Bonneville! Guess it never made production because of it’s resemblance to close to the Corvette. GM sold off some of these car at the Barrett Jackson auction. I know the Pontiac Bonneville sold for some crazy price. I think that went to a collection in Colorado. The 2 seat Oldsmobile in the Motorama is another one GM sold in the Barrett Jackson auction. I believe that 2 seat Buick also exists. Those cars are awe inspiring for the times they were built. Old GM show cars are sought after and very collectible. The Oldsmobile in the first picture is a very cool concept but I’ll bet it doesn’t exist and never hit the show circuit and it only existed on paper as a rendering. I was not around back then but I would have loved to attend the Motoramas as they must have been really special. I agree that todays car shows are boring and not inspiring! Good looking cars are both “unsafe”and “unfriendly to the environment”. Not that it matters. The youth of today don’t care for cars; they’re into their phones.